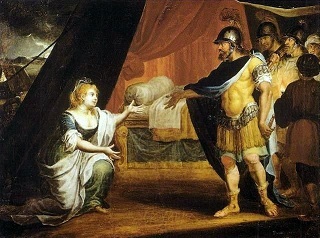 The Prayer of Judith: A Devotion from the Apocrypha | J.W. Wartick -"Always Have a Reason"
Just because you can find a quote by Martin Luther stating that these authors were portraying people speaking “in the Spirit” does not make it so. 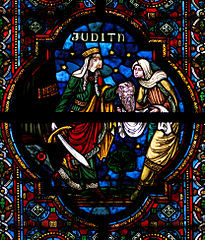 And just because Judith declares that the Lord “crushes wars” does not make it so. I can have full confidence in the teachings and story portions of Scripture, but I cannot in these apocryphal stories. Most of the error in Christianity has come through apocryphal stories + interpreted spiritually/allegorically interpreted + moralistic application. Are you suggesting that no extra-biblical text is useful? The Bible claims to be knowledge from outside the universe, and therefore has a position of ultimate importance. Apocryphal stories are part of human knowledge and therefore limited, uneven as to trustworthiness, and so on. If they are, does it not beg the question as to why they weren’t canonized in the first place? Well, this is exactly why I asked you to define “useful.” I am confused by the notion that if a book is “useful” it is somehow, on my position, Biblical. I find the dictionary useful. Should I now have to defend that that is not in the Bible? Any idea why the book was not canonized in the first place? I assume you don’t accept all apocrypha as useful. Who decides what is useful and what isn’t? What do you mean by “useful”? Useful to you (and yours) would be anything edifying in the faith. Was that question really that difficult? JD, I am slightly confused by these posts, coming in overlapping in time as they do. Were not you the first to mention the word ‘useful’? What do you mean by it? I completely disagree with A. Marburger’s definition: “Useful to you (and yours) would be anything edifying in the faith” and agree with you re: the dictionary. ‘Edify’ can mean almost anything nowadays, most commonly to make someone feel good. However, if taken in its biblical context it can only mean, encouraging and building up someone in the Word and the Spirit. Therefore, nothing apocryphal is trustworthy in that regard. So I am forced to ask again, perhaps rephrasing this time: Are you suggesting the Apocrypha states nothing truthful? If I say “God crushes wars” you would deny this? If I say, that God’s judgment is with foreknowledge, you would deny this? It seems to me that your view is just radically opposed to any truth claim in the Apocrypha. I have not claimed that it is on par with Scripture, but I dispute the claim that the Apocrypha cannot be used for devotional purposes. To say that would be to deny that any non-Biblical book can be useful for devotional purposes. After all, they aren’t the Bible itself. I need to see a positive argument from you rather than assertions. The point is that we cannot be certain of finding truth in the Apocrypha. And why would I or anyone want to ‘devote’ or meditate on anything other than God’s Word? Why would I waste my time on dross that may have a few slivers of gold when I can feast on gold? On the rare occasion when I utilize a devotional book, it is basically a mini-sermon on Scripture. Devotional, as you put it, is intended to point me, a believer, to God. Only the Holy Spirit does that using Scripture. My conscience is not reliable. The so-called table of nature was already dealt with as not reliable in Job 4-5000 yrs ago. So, what is left? Only the Word of God from Him is reliable to point me to Him. You asked for a positive argument. I will try to do so in this space, but it may not be adequate. 1. Apocryphal (adj. a story or statement of doubtful authenticity, although widely circulated as true) The story is assumed to be apocryphal, or in any case, the facts are unimportant (e.g., reposting some cute story with a moralism, to which I object, to which the reply: “don’t take it so seriously, it was just meant to encourage!”). 2. Allegorical (adj. interpreting a story or poem to reveal a hidden meaning, typically moral or political) It is assumed that one is to allegorize any story or saying: what is the true meaning or lesson behind the story? (e.g., God/Fate is inevitable, something bad happens to everyone. Only the fittest survive). 3. Application/moralism (n. a moral lesson meant to impose or enforce a rule or method, such as WWJD) It is assumed that once one has found the hidden moral lesson, they are to apply it as best they can. 4. How can I integrate or accommodate this story to my experience, knowledge or reasoning? Is there a similar story of someone who built foolishly like Hollywood houses in mudslides or who did not learn; what can I learn from others’ misfortune? 5. What can I or should I do (about my current crisis)? Where is my escape or way out? I should/must . . . .
6. What do I yearn for? What is Ideal? I yearn to have a good life, as painless as possible, to have as much as possible, a pure relationship with God, to be sinless, to have a perfect Christian life. 7. What is the given here? What is the determinism or oppression against which I am struggling to be free? My parents, upbringing, the old rule-based Christian life, other’s expectations. Questions for the reader: Does following this line of reasoning: story + allegory + moralism = hearing and doing Jesus’ sayings? How is it different? What did Jesus intend? First, please, get my name right. It’s J.W., not JD. It’s at the top of every page of the site. Please. It seems to me your entire understanding is based upon the notion that only God’s word is useful in any way for teaching. Frankly, I find your argument very unconvincing. I find sermons of Jonathan Edwards edifying despite not being Calvinist, I find Jane Austen’s works to be pointers towards God (and yes, morals! ), I see the truths of God in apologetic writing. Your wanton rejection of anything but the Bible is an unbiblical concept (Psalm 19, for example, tells us the heavens themselves declare God’s glory). Just because something is capable of being misused is not a grounds for rejecting it. The Bible is, unfortunately, misused all the time. I wonder if you would object to me using a devotion book. Maybe it’s just anti-Catholicism that’s happening here, but I could be wrong. Your whole post reeks of anti-nomianism, and yet you apply a lawlike moralistic argument to simply using the Apocrypha for a devotion. I’m not impressed. I’m very sorry about misreading your name. I must be getting more dyslexic as I age, I could have sworn I saw J.D. W, instead of J.W.W. 1. Edward’s sermons can be edifying (in the scriptural use of the term as I have above, not just making one feel good) to the extent that they are sermons based on Scripture. You can say to me and A. Marburger that it is a misunderstanding to use things other than Scripture for ‘devotion’, but again, God is the judge of what is devotional towards him, not you or I. I would rather follow his lead on that. You, on the other hand seem to create a dualism between heart and mind, with devotional in the heart category and therefore not important as to its source or truthfulness. Maybe I mischaracterize, but I am trying to understand how your definition of devotion differs from Scripture’s. 2. If you want to use a devotional book, who am I to say anything? You are free to do as you choose. I, on the other hand, can get more edification and devotion from spending a half hour untangling a difficult exegesis in order to let the Scriptures speak for themselves, which text always drives me to worship, awe, repentance, etc., than messing with something sentimental, apocryphal, allegorical, moralistic, and therefore unsuitable for pointing me to God. 3. You must have not read my reply above: conscience is unreliable, the table of nature’s insufficiency was dealt with already in Job, so I find your attitude unbiblical, not mine. I can use these things, but I don’t base anything on them. 4. I say that Scripture is the only thing God provided from outside creation to comment reliably on himself, creation, humans and their writings, and so on, and cannot be considered antinomian by any stretch of the imagination. I cannot fathom what you mean by such an assertion. How could devotional books like Jane Austen be considered ‘law’ against which I am rebelling? 5. Moralism is imposing something on someone else, or judging them. I do no such thing. You are a free person before the Lord. And I am responsible to live my own life before the Lord. I have come, after many mistakes, to eschew human prattle that invariably leads astray, for the truth of God’s Word, taught by the Holy Spirit, in the company of other believers, which can more reliably guide me to trust in Christ. And I repeat, most of the error in the Church has come from apocryphal stories, allegorically interpreted, and applied moralistically to congregants made to feel guilty. So, why would I not eschew to the best of my ability all three practices, and instead attempt the other direction? So, if I were to simply redefine the Apocrypha as a devotion book, would that still make it difficult? Particularly because I read the Bible daily as well. The Scripture, on the other hand, is determinative. It corrects the apocrypha and other background material, not vice versa. It is the only thing we have with God’s stamp of approval as to its veracity and truthfulness. Even Austen can be read for understanding human nature, understanding a particular culture at a particular point in time, and so on. These and nature and the conscience point to Christ. But they do also carry baggage that has drawn many away from Christ to engage in unbiblical and unhealthy practices and attitudes. Of course the Bible can be misinterpreted, it is everyday, but I maintain it is mostly due to it being reduced to the level of an idea which can then be put on a par with any other idea subject to human criteria and the will of the beholder. A good example of what I mean by apocryphal story + allegorical interpretation + moralizing application is a recent sermon I heard based on the Lion King story (with of course a scriptural reference to justify it being a sermon), then spiritualized (allegorized) it as a picture of our being Christ in the world, and concluded with something we should do about it (moralized). On the other hand, I heard a sermon in our church last Sunday before the election based on 1 Cor 7:29-31. In a nutshell, Paul is reminding us that what Christ has done in the past has made us citizens in the Kingdom of Heaven. That past event has turned us into travelers now. This world is no longer our home and Jesus has won the new heavens and new earth for us as our true home. But, at the same time, our journey takes place in this world. So we get involved in this world and seek its welfare and the welfare of its people. Yet… since the appointed time has been shortened and the present form of this world is passing away, we hold everything loosely. We remember that since we’re travelers in this world, everything in it is a temporary gift from God to be used for His glory before the unbelieving world. One takes a pantheistic story and tries to find biblical (under the guise of spiritual) meaning and ends up enjoining me to a adopt an impossible view of reality, whereas the latter takes a scriptural word to believers in the first century, and says that because of who God is and what Christ did, I can have the same eternal, yet here and now, approach to life and the people around me. Why would I knowingly choose to consider the dissembling of the former when I can have, and be built up in, the truth of the latter? btw “simply redefining” is symptomatic of the problem we are talking about. Sorry, I meant Lessing’s ditch, not Dilthey. Once again, we find ourselves in the infinite loop of your abject failure to answer even simple questions. I thought you’re supposed to “always have an answer” ..lnot always redress the questioners with demands for arguments. So the question remains: if apocrypha is useful (as in edifying) for the faith, why were they rejected in the first place. Your dictionary analogy is juvenile…clearly you don’t seek a dictionary for spiritual guidance. So why weren’t they included? Who draws the line (even among the competing Catholic and Protestant bibles)? And what Biblical basis do you have for seeking devotionals in non-canon-based scripture? First, have you ever heard of something called a “devotional book?” For example, my wife and I are currently using one that draws Christian truths from Jane Austen books. Your notion that you can’t use anything but Scripture for a devotional is a fairly obvious misunderstanding. Regarding the Canon, you’re asking a really broad question, and I really do fail to see how it is relevant to this post. It seems like you’ve fallen into the “object to everything” type of atheism. But, for the sake of argument, I’d simply note that the Apocrypha fails a number of tests for canonicity–for example, it predates the NT and yet was rejected for the Jewish canon by the Jews and other early church fathers such as Melito, Origen, Cyril of Jeursalem, Athanasius, etc (it wasn’t until Augustine that a church father wanted to include them). They also fail tests of authenticity, history, and the like. This post is not disputing the canon, though. I’m merely writing a devotion, which, as I’ve noted, can be done from something like Jane Austen’s works. Maybe you should think more carefully before you just try to universally object to everything. That’s intellectual honesty, but I’m starting to think it is something you are avoiding. Your insults (“juvenile”, etc. ), unfortunately, seem to be becoming par for the course for you. If you’re really here for honest interaction, be honest. You shouldn’t have to resort to name-calling.